DEADSMOKE + TONS TO KICK OFF EUROPEAN TOUR THIS MARCH! Down-tuned monolithic guitar riffs scraping the soil down to the core of the earth; slow, hypnotic and dissonant cadences recall the eternal need for isolation and the atavistic fear of nothingness. Your soul will be burned, and smoke is what remains after a memorable show on this exciting tour: HEAVY PSYCH SOUNDS RECORDS & BOOKING is proud to get heavy weights DEADSMOKE on the road this March! Kicking off on March 20th in Italy with dates in Switzerland, Germany, Austria and the Netherlands, the Italian power Doom and Sludge foursome has teamed up with no one less than label mates, Turin-based Doom masters TONS. 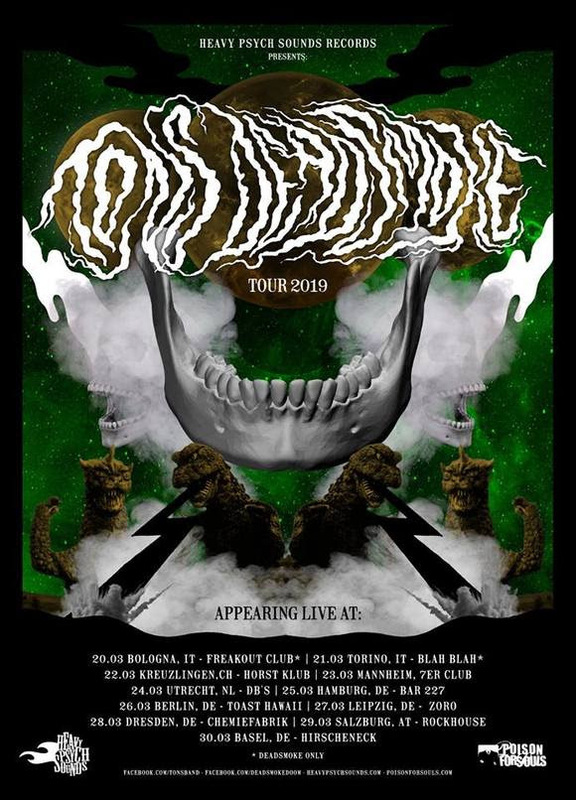 „Tons and Deadsmoke can’t wait to hit the road again, this time together as a monolithic combo touring the most noisy smoky buried venues of Europe and taking their deafening spaghetti Doom to the big audience. A blaspheme haze of corrosion is flowing up north, spreading curses, illness and tons of smoke.“ the bands are excited to hit the road together soon. The atmosphere around both groups is not only so devilish, mesmerizing and noisey, but will take the entire crowd on a ride through the heaviest soundwalls in psychedelic doom landscapes. To get you in the perfect mood for their upcoming tour, DEADSMOKE just released a new live video, filmed at their recent show at the HEAVY PSYCH SOUNDS FEST in Deventer, Netherlands. Prepare yourself for one of THE doom tours of the year and watch the band’s new live video right HERE!